I never reviewed Alike Studio’s cute and colorful point-and-click adventure, Love You to Bits (LYtB) and, while I did enjoy my time with it, there were some issues that kept me from being as enthralled with it as others were. In it, you played as Kosmo, who’s in love with a robot named Nova that gets blown to bits. You then search the galaxy for her pieces so you can put her back together again. The art style is quirky and you meet all sorts of zany creatures, and there are even levels that play homage to other games, such as Monument Valley. The controls are fairly simple, as inventory items are used automatically if you have the right item and tap on the right object. There’s no dragging items to everything until something happens. It’s a good streamlined system that works well on mobile. But the slow walking pace of the protagonist, some tediously big levels and the inability to save mid-level wore on my patience. Still, when their latest game, Bring You Home, released this week, I bought it without question. I also assumed it was going to be another point-and-click just with a new character and story. I couldn’t be more wrong, but I love the new game to bits. In Bring You Home, any issues I had with the previous game are gone because the mechanics are completely different. 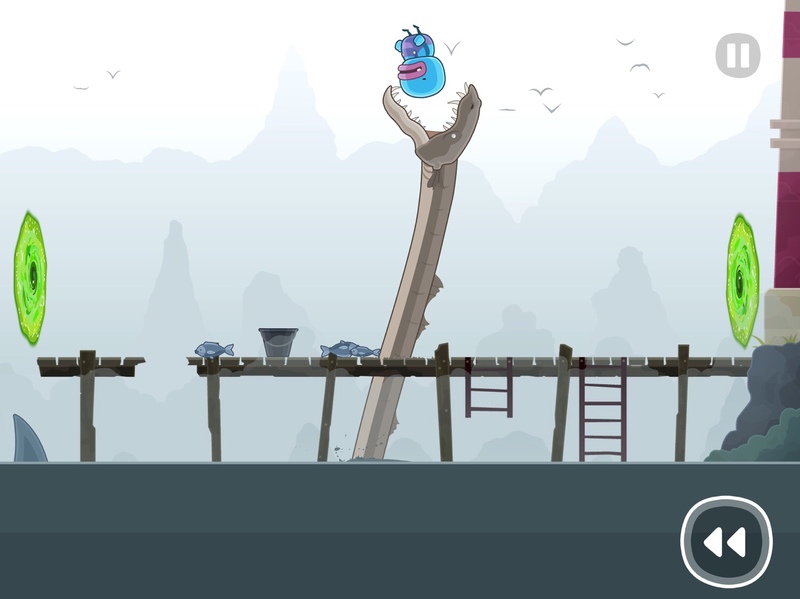 Instead of controlling your character, you manipulate the environment by swapping panels, similar to the lovely FRAMED. It starts off with a game of fetch between some blue alien named Polo and his pet dog — or some alien creature that behaves like a dog. In middle of the night, two cloaked figures appear through a mysterious portal and dognap his beloved friend! He jumps out the window in an attempt to chase after them and falls. That’s when you’re shown you can rewind time and cycle through different panels to find one that would allow him to chase them through the portal. In this case, it’s putting a wagon of hay below his window to break his fall. In each level, you have as much time as you want to arrange the panels before you press Play to see them, well, play out. 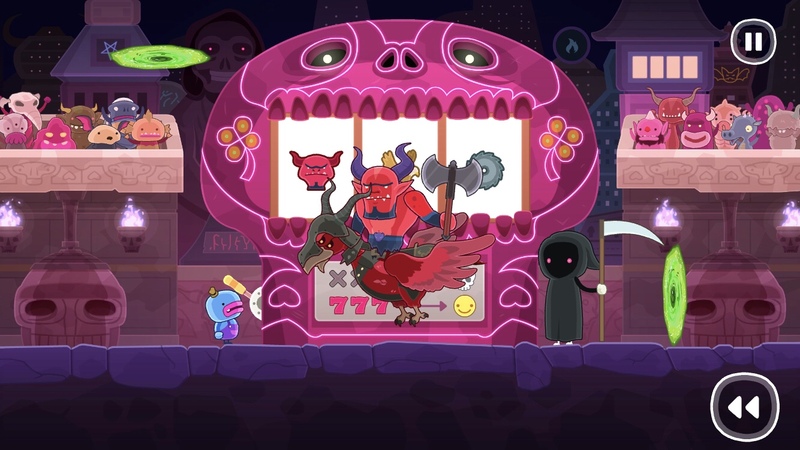 As you make your way through the the game’s forty-seven unique levels, the mechanics are mixed up a bit to keep things fresh. At first you can only swipe downwards to change the panel, but soon enough you’ll be able to swap panels side-to-side. And of course, the two mechanics get combined for even more challenge and mayhem, allowing you to move them both horizontally and vertically. 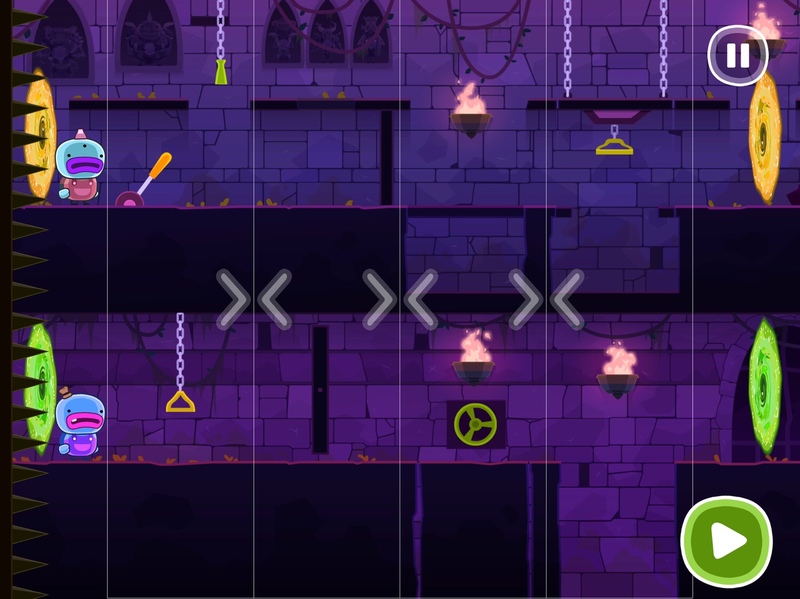 Later, you’ll have multi-step puzzles that let you pause after the first section and then make another change. That’s pretty much everything you’ll see, but the way these mechanics are utilized is where all the fun and charm comes in. As with Love You to Bits, each planet you land on will have a different theme, and sometimes even a completely different art style. There’s one that looks like a Mario game, though since there’s no actual platforming involved, I loved it. Another one has Polo running through paintings on a wall, changing to match each one — even a Picasso-like! While the game can get tricky here and there, you’re likely never going to stay stuck for too long. The trial-and-error nature of it means you’re just a few failures away from success. But what the game lacks in challenge, it more than makes up for in creativity, discovery, and just pure joy. If you focus entirely on solving each puzzle and making your way to the end, you’ll finish it pretty quickly. But take your time to enjoy all the failure animations they added and that’s where you’ll find the real entertainment. One level has a slot machine with three panels that can be cycled through five times. Whatever combination it lands on, it creates an animation for you, made up of a figure, its transportation, and its element. So you might end up with a clown riding a flaming bird. Or a demon driving an armored car. I spent so much time trying out the different possibilities and I’m not sure I saw all of them. And while some might criticize the game for relying too much on trial and error, I would argue that most of the time, it’s the good kind of trial and error. I’m not keen on games just having no rhyme or reason to their solutions so that by the time you do figure it out, you’re not really sure why it worked. There is logic to the puzzles in Bring You Home, even if you might need to fail a few times to see what it is. 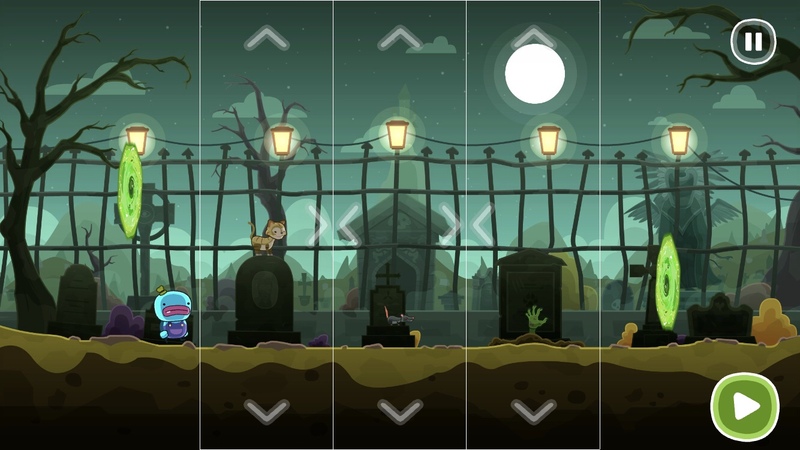 For instance, there’s a graveyard level that has a werewolf and a zombie hand that can both kill you. There’s also a cat and some other critters. You need to figure out how you can distract one of the monsters, and you’re only going to know by trying out different scenarios to see how each monster and creature reacts. It reminded me a lot of FRAMED, as I mentioned earlier, and I’m really happy to see other games exploring this mechanic but with their own distinct style and personality. This game is also more kid-friendly, as you’re never racing against a clock. So if you had any issue with FRAMED‘s more reflex-based puzzles, you should be able to fully relax here. 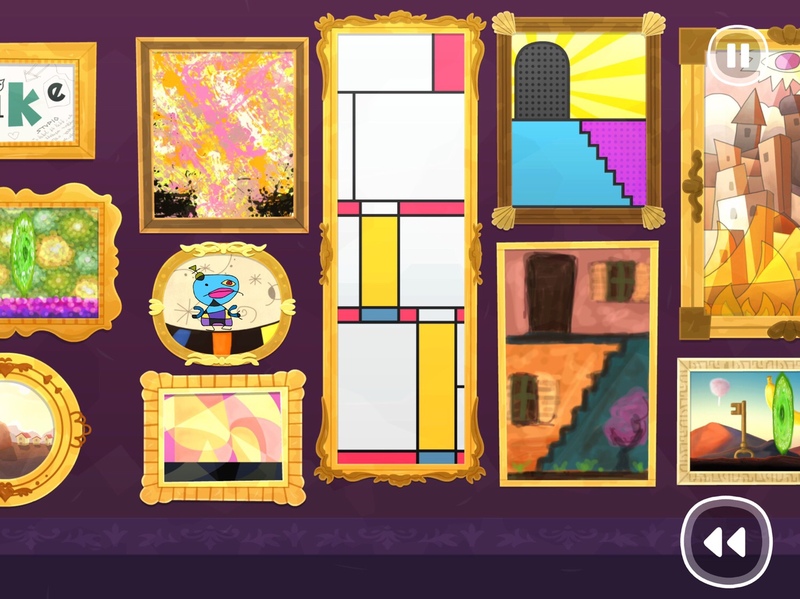 For those who take the extra time to experiment with each level, there are fifteen collectibles to find in the form of photos and a handful of hidden achievements that you only get by taking a route different from the intended one. I liked these extra challenges, though I want to stress again that exploration is a reward in itself here. This is definitely one of those times where the cliche holds true that it’s the journey, not the destination, that matters. Though I will say, the ending was surprising enough for me that I wouldn’t brush it off as unimportant. But if you stop and take in all the little details, you’ll notice things like Polo losing his tiny hat every time some creature eats him (spoiler: he gets eaten a lot). There’s even one level where you have about five different magic wands you can play with to see what they do. Point one at a mirror and you’ll shrink yourself and get nabbed by a mouse. Another will bring a skeleton to life, who’s very angry at you for some reason. If this game doesn’t make you smile, I don’t know what will. It’s just so delightful. On top of everything, the developers learned from their last game to include certain amenities like separate music and sound effects toggles if one bothers you but the other doesn’t. Because of the amount of time I spent in each level of LYtB, the music started to get repetitive and grate on my nerves. But early on, there was no way to shut the music and keep the sound effects on. They added the option later and thankfully brought it over to this game. I never got sick of the music this time around, so it wasn’t necessary, but I still appreciate having the option. iCloud sync is included as well, and it works flawlessly. 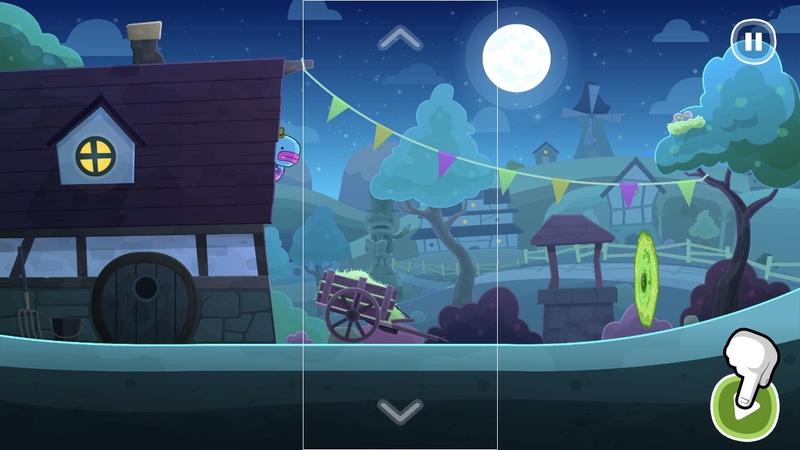 You can play at home on a nice big iPad — or on Apple TV if you have one! — and then pick up on your iPhone when you’re away from home. I don’t know why this isn’t the standard for all games by now, but until it is, it’s worth mentioning. For those wondering how it plays on Apple TV, you use the touch pad to move between frames. Click to select one, then either swipe up/down if that’s an option, or swipe left/right if that’s an option. Then click again to confirm your selection. When you’re ready, just press Play. I don’t think it’s quite as nice as just manipulating things directly with your finger, but if Apple TV is your choice to game on, it works quite well, if not as intuitively as on a touchscreen. And if you want to show it off to friends or family or play together, this is a great way to do so. Bring You Home provided one of the best experiences I’ve had gaming on my iOS devices. Not every level is pure brilliance, but there’s enough playfulness here to make anyone feel like a child again. All I could really ask for is more, as I was sad when it was over. I loved every bit of this game and I hope the developers either add content like they did with LYtB or give us a sequel. But even at its current length, I can easily recommend it to everyone of all ages. Unless you’re a scrooge who just hates smiling. It proves that a puzzle game doesn’t have to be brutally difficult as long as it gives you something to do besides solving the puzzles. If you want a game that will bring you joy, this is the one. So stop thinking about it and go grab Bring You Home here. And if you’re stuck, try my complete walkthrough guide. One of the few games that has made me laugh out loud – often. Gifted it to a friend by the fifth level. Highly recommend! Great game, great review! Got stuck on Level 45 and came across your review/walkthrough. Love that you explain the logic behind it.